Nestlé Purina stands for trust, and the Purina® brand consistently ranks as a leader in trust among pet owners. We work hard to earn that trust every day through unparalleled knowledge of our consumers and their pets, expertise in nutrition, our comprehensive range of high-quality established brands and our dedicated associates whose mission is to enrich the lives of pets and the people who love them. Nestlé Purina promotes responsible pet care, humane education, community involvement and the positive bond between people and their pets. A premiere global manufacturer of pet products, Nestlé Purina is part of Swiss-based Nestlé S.A., a global leader in nutrition, health and wellness. As of Dec. 31, 2017, Nestlé Purina employs approximately 8,200 associates in the U.S. 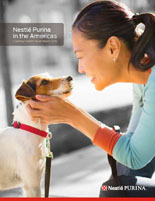 In the United States, Nestlé Purina PetCare Company is the leading pet care company in sales, volume and market share. As of December 2017, Nestlé Purina U.S. has achieved 14 consecutive years of improved sales growth and profit. 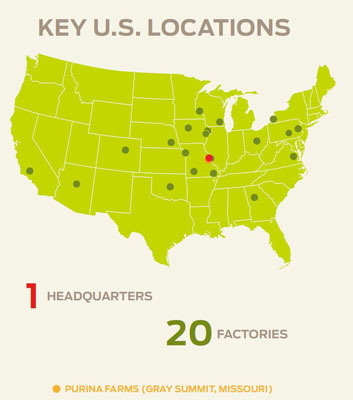 Nestlé Purina PetCare Company operates 20 factories in the United States. Nestlé Purina has a team of more than 500 global pet experts, including nutritionists, that create formulas specific to pets' needs. In 2017, Nestlé Purina donated $28 million worth of pet food, pet supplies and monetary contributions to pet-related charities and other community organizations in the U.S. 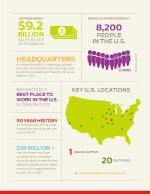 Learn about Nestlé Purina’s history here.